Joanne Hall frequently travels to teach weaving. This list of possible workshops and short courses is a suggested list, so if you have something specific in mind, just ask. First is a list of workshops which run all day for 1 to 5 days. Where appropriate, a suggested materials fee per person is listed. The second list is of seminars or short courses from 1 hour to 1 day. Joanne can accommodate your guild member’s interests. If you have need for a specific topic or technique for beginners, ask for more information. Warping techniques can be included. Materials and wound warps can be sent in advance of the workshop. Many new weavers are trying rigid heddle weaving. Usually starting with a wool scarf, a variety of techniques can be included. If you are interested in tapestry, laid-in, color and weave or double heddle weaves, they can be included. Double heddle weaving techniques can be included. Often looms as well as yarns can be provided for the class. Band weaving can be done by threading small rigid heddle reeds, woven as back strap weaving. Plain weave as well as pattern weaves can be included in a workshop. When possible I can bring the two treadle, two shaft band loom for each to try. For most of her weaving years Joanne has been interested in Swedish weaving. Her interest comes from her Swedish heritage as well as a respect for the high quality of weaving in Sweden. A workshop from Hans Krondahl, a Swedish art professor who wove commission tapestries inspired her in the early years. After eight trips to Sweden, attending four weaving conferences in Sweden, taking weaving and language classes, touring Swedish weaving factories and shops and meeting many Swedish weavers, Joanne enjoys teaching Swedish weaving techniques. This workshop is taught in either of two main categories of weaves: One is the Art Weaves: Bunden Rosengang (bound weave), Rolakan (tapestry), Dukagang and Krabba (laid-in weaves) and Munkabalt (monk’s belt). The other category is the Drall weaves: Two block damask on 4, 6, 8 and 10 shafts, Halvdrall (two block pattern weave), Sjusprangsdrall (Swedish lace), Jamtlandsvav (crackle), Daldrall (overshot), Salldrall (M’s & O’s), and Kukkala (four block pattern weave). Send a list of requests from the weavers in your group and we can put together a fun workshop. Materials and pre-wound warps can be sent in advance, approx, $30-50 materials fee, depending on weaves chosen. This workshop is designed to help you develop your skills in tapestry. Tapestry techniques are easy to learn when there is someone to help you. This workshop will include all you need to know to weave your first tapestry with or without a cartoon. Finishing and hanging instructions included. Longer workshops can include color blending, developing design ideas into cartoons and warping techniques. Warp and/or weft can be provided for a materials fee, $5 to 30. 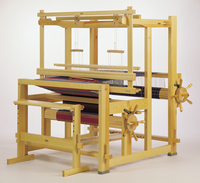 Tapestry frame looms can also be provided. While in Sweden Joanne visited the Stockholm HV tapestry workshop where the large tapestries are woven. This workshop draws on the techniques used there and the techniques she learned from Hans Krondahl, a Swedish fiber artist. The most distinguishing characteristics of this weave are the texture on the surface and the visible warp. Participants should already know some tapestry techniques, or an extra two or three days can be added. Many possibilities will be presented for this very flexible approach to weaving. Warp and weft can be provided for a materials fee, $25-45. Rag rugs woven in Sweden have some distinctive characteristics. The designs are often carefully planned. Decorative techniques in plain weave, tapestry and laid-in techniques can be included. Also, there are rugs woven in many ways on a twill threading. Monk’s belt, interlocked double weave, crackle, goose eye and rosepath are some of the common threaded patterns for rag rugs. Warp threads and supplies can be supplied for about $5-20.00, depending on warps chosen. This workshop is for those who would like to weave on a drawloom. Because the equipment is large, arrangements would need to be made to provide equipment. If someone in your area has a drawloom and there is a group interested, Joanne can teach you how to set up the drawloom, put a warp on and tie up the treadles. The most common weave is damask, as it is very easy to weave. 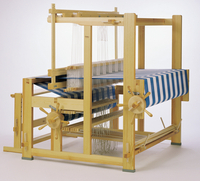 It can be set up on a counterbalance loom without a drawloom and woven as a half heddle pick up weave. Opphamta can also be set up on a simple loom using half heddle sticks. Being able to warp a 4 shaft weave is necessary to be ready for this workshop. Perfect tension? No threading errors? Perfect tie-ups? No broken threads? Is this too much to ask? Some weavers have attained this level of proficiency in most of their weaving and actually enjoy warping their loom. If you have tension problems, loose selvages, broken threads or other warping or weaving problems, perhaps there is something you can learn from this seminar. Maybe you have learned some methods that do not work for the kinds of weaving you do or the warps you use. If you have ever wished you could enjoy the warping process as you anticipate your weaving, this seminar is for you. Maximum 30 participants. If you are interested in expanding the pattern capabilities of your four-shaft loom, this seminar will show you how. You can weave damask and pattern weaves with designs you can draw on graph paper. By adding half heddle bars behind the shafts of your current loom, you can begin to make complex designs for many kinds of weaving. You do not have to be an advanced weaver to understand this kind of weaving and you only need 4 or 5 shafts on your loom, and 4 or 5 treadles.